Corfu is one of the most cosmopolitan islands of Greece. Situated in the northern side of the Ionian Sea, Corfu is also known as Kerkyra and it has many wonderful sights. A gem for sightseeing is the Old Town, with the two Venetian fortresses, the interesting museums, Spianada Square and Liston Street and the wonderful paved street. There is a church of Agios Spyridon that is in the street beside Liston is the protector of the island. The Jewish quarters are also very interesting. Other interesting places to visit during the Corfu holidays are the Medieval Castles and monasteries in the inland, such as Paleokastritsa and Angelokastro. Wonderful beaches and verdant vegetation surround the villages around the coast lined up with hotels and restaurants. This 4-star hotel offers rooms, most of which are new, equipped with air conditioning. services and facilities include a swimming pool surrounded by a beautiful garden, a lounge with outdoor terrace overlooking the bay and the city, babysitting and laundry..
Just 300 metres from the beach, Aronis Apartments features a pool and free Wi-Fi. Its self-catered rooms have a balcony with views over the Ionian Sea and green landscape of Corfu.--All units at the family-run Apartments Aronis have tiled floors and lots.. This classic style decoration establishment offers 27 rooms distributed in three different floors as well as a large range of services and amenities for clients searching for relaxing holidays adn beautiful sea views. The Feakio Hotel is situated in the picturesque and attractive area of Gouvia, Corfu. It consists of rooms designed to offer guests comfort and services. The hotel amenities include a swimming pool, a restaurant, and a bar. It is a perfect choice for..
Gouvia, a former Venetian naval base is nowadays one of the most beautiful seaside resorts of Corfu boasting a large marina. 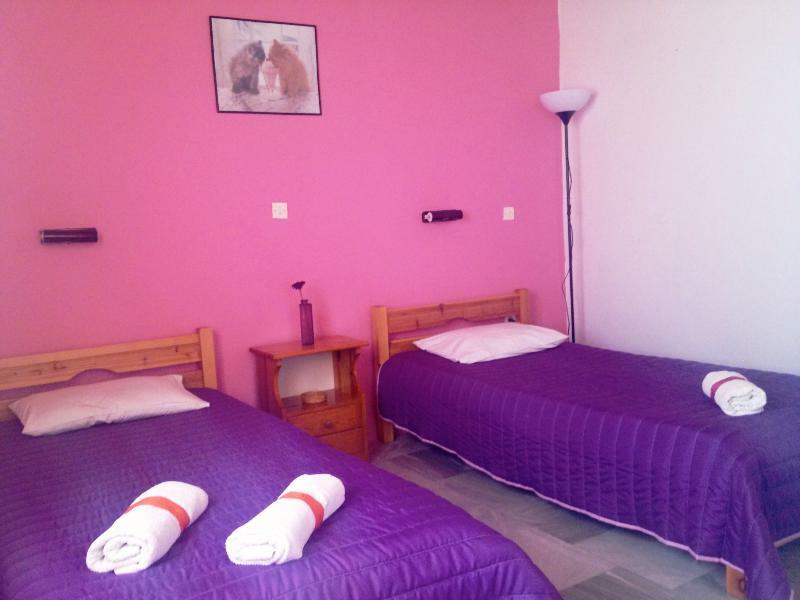 Just 150 m from the beach, restaurants, clubs and shopping centres, this hotel is situated in the heart of Gouvia, perfectly..
Irene Apartments and Studios are situated in Agios Gordios, a verdant area surrounded by trees and rocky mountains. It is 300m from the beach and 20m from the village centre. The beach is almost 1km long and is one of the best on the island. There is..
Thinalos Hotel is built on a wonderful, sandy beach 7km long, ideal for children. Here you can enjoy a quiet, pleasant, family holiday in a wonderful natural environment. The hotel's pool located in an elegant area and surrounded by palm trees & exotic..
Just 30 m from Kavos Beach amidst a lush garden, Alexandra Apartments features self-catered accommodation with free Wi-Fi. A mini market for the essentials is available within the premises.Simply furnished, all studios open to a spacious balcony with..